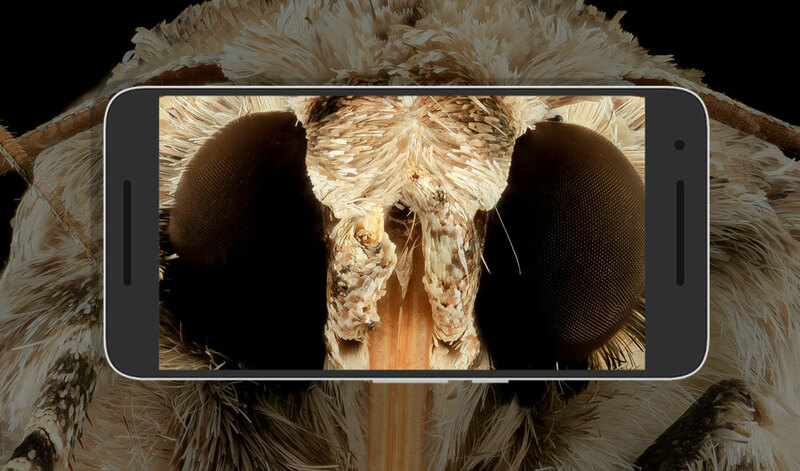 Nanostructure similar to moth eyes could help cut reflections on smartphone screens. 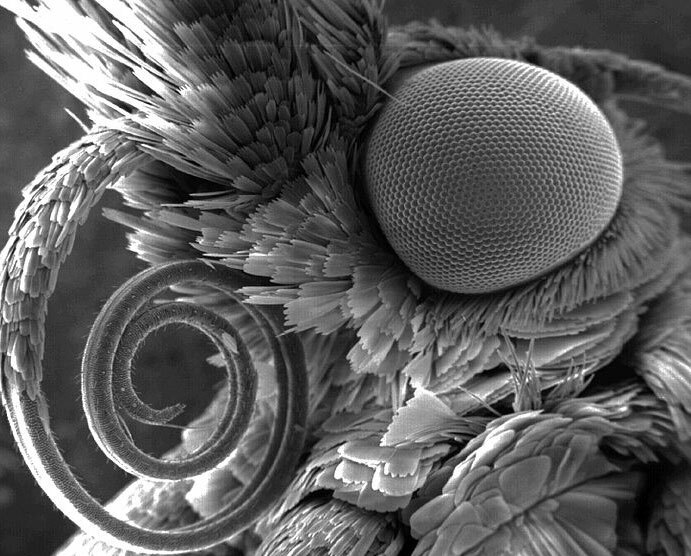 (Inside Science) -- Moths' eyes sport nanoscale structures on their surfaces that minimize light reflection. This feature helps the insects to see better in the dark by reducing glare, and also makes it more difficult for predators to spot them by looking for the twinkle in their eyes. Inspired by moths, engineers and materials scientists have been developing anti-reflection films to increase efficiencies for solar panels, to lower battery consumption for smartphone displays, or even just to improve the appearance of highway billboards. Moth lovers, don't be alarmed -- we are not harvesting the insects for their eyeballs. Instead, the researchers are experimenting with materials and fabrication techniques to recreate this nanoscale structure in the lab. Just this week, a research group at the University of Central Florida in Orlando published a paper in the journal Optica that introduces a new anti-reflection film. They claim to have optimized their product specifically for smartphone screens, and they also provide a model that other researchers can use to optimize their own films in the future. The scientists, part of the optics and photonics research group led by Shin-Tson Wu, use a technique similar to stamping to create the special new film. They first deposit a solution with nanoscale silicon oxide spheres onto a surface. The nanospheres are only about 100 nanometers across, or almost one-thousandth the width of a human hair. Then, they spin the surface to spread out the nanospheres -- the faster the spin, the farther apart the particles. The surface is then dried with the now embedded tiny spheres, and used as a stamp to imprint tiny dimples onto the final product, creating the nanoscale structure that mimics what moths have on the surface of their eyes. The technique still has some issues to iron out. According to Wu, some of the silicon oxide nanoparticles would come loose during the imprinting process and get stuck to the film, which makes the stamp nonreusable. In the future the researchers hope to develop a reusable stamp using a mold instead of nanoparticles. "Whenever you talk about applications where you have to fabricate things with large areas, imprinting is usually a good choice," said Dietmar Knipp, a materials scientist from Stanford University in California who was not involved in the study. "But the way that they are doing it, the stamp with the nanostructure is destroyed in the end, so that if you want to do it again, you'd have to start the process all over again." The road from lab to market is often lined with such obstacles. In the case of anti-reflection films, manufacturing cost is a big one. The consumer electronics company Sharp has been talking about making a TV with the technology since at least 2012, and Philips has actually made one, but with a $3,000 price tag. "There are already some commercial products that use this kind of anti-reflection surface, but there are still some issues," said Guanjun Tan, a graduate student in Wu's research group at the University of Central Florida. For instance, the anti-reflection film used in the Philips TV is known to stain easily. If it coated smartphone screens, the constant touching from people’s fingertips would damage it. Tan said that after experimenting with several materials, they have found a film that is considerably more resistant to scratches and staining from water and oil. They also considered flexibility to be an important feature, since scientists and engineers are working to develop foldable displays for the near future. "For this paper, we optimized the material to have more flexibility, but then we lose some surface hardness, and less anti-scratching," said Tan. Such tradeoffs, it seems, are common in the world of engineering. Nevertheless, the researchers claim their film can provide a four-fold improvement in color contrast for a smartphone screen viewed under sunlight. Material scientists try to replicate the anti-reflection properties of the tiny domes on the moth's eye. Another part of the study may help researchers develop different applications for the anti-glare technology. "We have also developed a simulation model that other people can use to optimize the nanoparticle's shape, depth [and] diameter, for the optimal anti-reflection," said Wu. For example, an anti-reflection film for solar cells or highway billboards might not require the same resolution as a smartphone screen, so researchers can choose to sacrifice certain attributes for other ones. For now, the researchers’ model is based on their approach of imprinting films with tiny spherical dimples -- but there might be better nanostructures out there. Other researchers have tried nanoscale pillars and even cones, but according to a 2011 paper by Knipp, the ideal nanostructure for anti-reflection may be tiny, parabolically curved domes. "Ultimately, that is probably the closest to optimum -- after all, that's what's found in nature, in moth eyes," said Knipp. However, compared to pillars, cones and dimples, a surface with tiny parabolic domes is even trickier to make. So, when it comes to perfecting anti-reflection, we are still chasing after the moths.